For my first try I printed out a herringbone rack and pinion and screwed it to a board with some countersunk screws. That was the most successful part of the project: the pinion, mounted to a stepper motor, moved smoothly back and forth along the rack in spite of the screws interrupting the rack teeth. The stepper had two roller bearings functioning as wheels holding it up in back, and it was supported in front by the rack. I printed a wheel to apply pressure to the string (simulating the finger/fret), and a v-shaped support to raise the wheel above the pinion and to centre it. Originally I had the wheel mounted to just one of the motor’s screw holes, but since it was off-centre the pressure from the string pushed the motor on its side. The wheel rolled smoothly along the string, so that was cool too. The string was held by a couple of eye bolts with grooves cut in them to keep the string in place (replacing the guitar’s nut and bridge), and was connected to a machine head for easy tensioning. 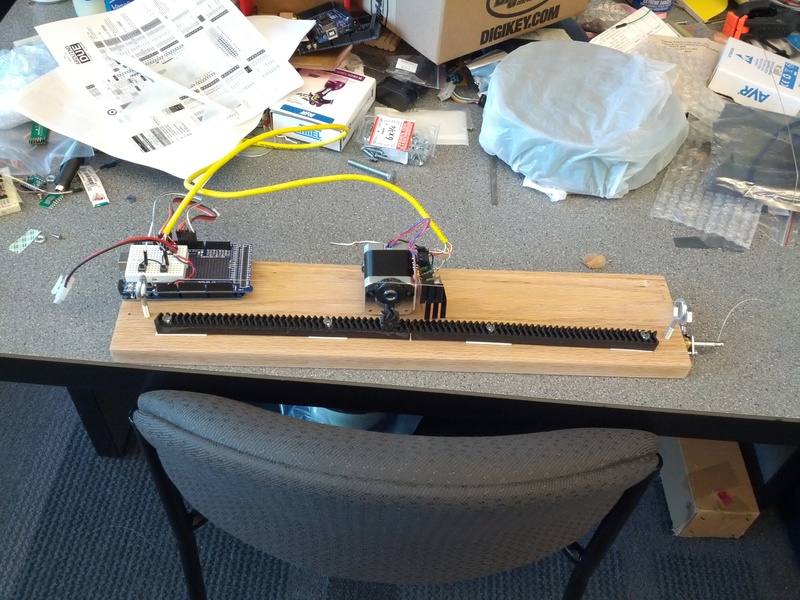 The stepper was controlled by an Arduino with two buttons to make the motor turn back and forth. The stepper had too much inertia and its centre of mass was too far back. I was hoping that between the herringbone teeth on the rack and pinion, the wheel groove, and the downward force from the string, the motor would move relatively smoothly. Unfortunately it couldn’t move at high speed accurately and stably. At a certain point on the rack it would just twist itself off. I didn’t bother installing a plucking system or a frequency sensor. Instead I started work on version 2, which uses a Makerslide linear bearing and a more traditional belt-and-pully system for moving the carriage back and forth, kind of like in the MechBass video that I linked to above. I like the idea of having the string “fingered” by a wheel instead of fingers à la MechBass, it ought to produce a neat slide-guitar effect and will also make it very easy to add vibrato to a note. Anyway, version 2 is underway and I think it will solve most or all of the problems from version 1 that I listed above. Alas, I didn’t order enough parts and our 3D printer broke, so as of this writing development is paused.